While participating in the HP Canada Brain Training Challenge, I needed to download some apps from the Windows Store and couldn't for the life of me figure out how to search for a specific app. I looked and looked for a search bar but couldn't find one. Until I searched online, that is. At which point I felt the palm of my hand connect with my forehead. It's that easy. 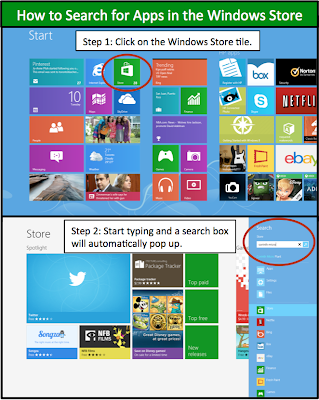 In just two simple steps, you can search for the app you need by simply clicking on the Windows Store tile on your Start page and then start typing. Automatically the search bar will pop up along with any possible matches. You can remove your hand from your forehead now. Haha I'm glad you found an answer without too much trouble! I'll be doing this later today on hubby's pc....thanks for the info, it would have probably driven me wonky!